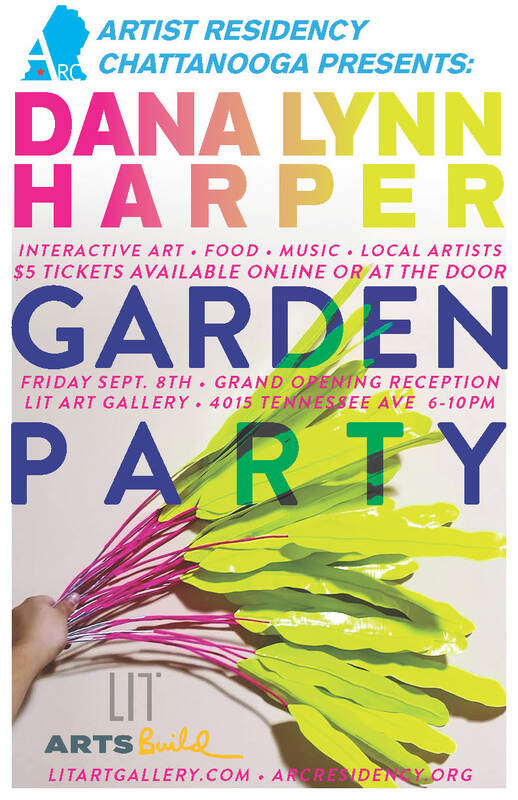 Join us for an opening reception of Dana Lynn Harper's ARC culminating environmental installation "Garden Party," Friday, September 8th, from 6-10pm. Entry is $5, tickets NOW available online, or cash will be accepted at the door. This includes a free drink at the Mad Knight Brewing Co downstairs! In addition to our visiting artist's work, there will be local artists' work (artists listed below) on display throughout the building, live music on the loading dock by Tryezz Official, and the artist will be in attendance to chat. "I enjoy making bright, beautiful work that explores moments of self-transcendence, where time is slowed down and the outside world is forgotten, a place where the spirit rises and pre-conceived realities dismantle. Equally inspired by vast landscapes and infinitesimal plankton and pollen, the installations simulate the feeling of size and perspective fluctuation. Simultaneously referencing multiple places, my work becomes a portal to warm feelings and childhood fantasy."